NEW YORK, March 22, 2018 /PRNewswire/ -- Getty Images, a world leader in visual communication, today released a unique collection of images – Watermarks for Water – kicking off an initiative that aims to help raise awareness and funds for the global water crisis by transforming the iconic Getty Images watermark. When a collection image is licensed at www.watermarksforwater.com, the watermark that highlights the global water crisis is removed and 10% of proceeds go directly to charity: water, an organization that brings clean and safe drinking water to people in developing countries. Getty Images worked with the Chicago office of FCB, a global ad agency, to launch Watermarks for Water. The agency's parent company, Interpublic Group of Companies, has made a commitment to UN Sustainable Development Goal #6 and helped Getty Images identify charity: water as the NGO partner for the initiative. In 2015, Getty Images was a founding partner of the United Nations' Global Goals campaign, a set of 17 ambitious targets with the aim of ending poverty, fighting inequality and tackling climate change by 2030. "At Getty Images, we believe in moving the world with images. Water is one of the most essential elements in our lives, so on World Water Day this year, we're kicking off a movement to help bring awareness to and raise funds for the global water crisis," said Getty Images Chief Operating Officer Craig Peters. The Watermarks for Water collection is comprised of more than 300 images, shot by some of the world's best photographers, that highlight the plight of clean drinking water. While the majority of images are from the Getty Images celebrated creative collections, select editorial photographers such as Brent Stirton and Tom Stoddart have contributed images to the cause. On March 22 – World Water Day – to kick off Watermarks for Water, 25 images from the collection will be on display for purchase at the Watermarks for Water Exhibition at 45 Lispenard Street in New York City, with all proceeds benefiting charity: water. "One of the things that struck us the most when working with Getty Images on this campaign is that more people die from drinking impure water than from war," said Liz Taylor, Chief Creative Officer of FCB Chicago. "That insight led us to take one of Getty Images' most recognizable assets – the watermark – and flip the idea on its head: What if, by removing watermarks, we could start a global movement to bring clean water to those around the world who lack it?" From the Watermarks for Water microsite, people will have the option to either license an image or share it on social media. Each image shared socially will retain its watermark along with a compelling fact about challenges surrounding clean drinking water. There will also be a homepage takeover, a first for the brand, on the Getty Images website that will place Watermarks for Water on the homepage for the day. "Every person on this planet should have access to clean drinking water," said Bilal Zaidi, Director of Brand Partnerships at charity: water. "We're excited that Getty Images is joining us to provide clean and safe drinking water to people in need, and helping to raise awareness around the world water crisis." 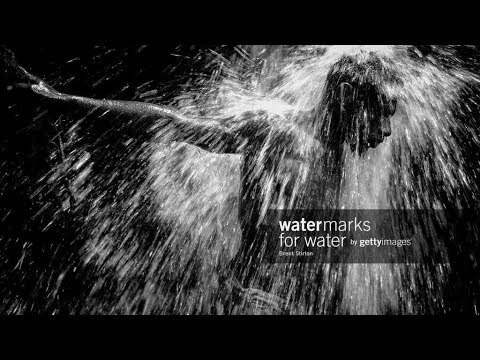 Getty Images is encouraging people to watch the Watermarks for Water video, visit watermarksforwater.com to learn more about the water issues we face, purchase an image or share on social using the hashtag #watermarksforwater. Getty Images is one of the most trusted and esteemed sources of visual content in the world, with over 200 million assets including photos, videos, and music, available through its industry-leading sites www.gettyimages.com and www.istock.com. The Getty Images website serves creative, business and media customers in nearly every country in the world and is the first place people turn to discover, purchase and share powerful visual content from the world's best photographers and videographers. Getty Images works with over 200,000 contributors and hundreds of image partners to provide comprehensive coverage of more than 160,000 news, sport and entertainment events each year, impactful creative imagery to communicate any commercial concept and the world's deepest digital archive of historic photography. charity: water is a nonprofit organization bringing clean and safe drinking water to people in developing countries. With a radically transparent model that sends 100% of public donations straight to the field, charity: water funds sustainable water projects in areas of greatest need and works with local partners to implement them. The organization proves every project, using innovative technology and powerful storytelling to connect donors with their impact. Since 2006, charity: water has funded more than 28,000 water projects around the world to help 8 million people get access to clean water, hygiene and improved sanitation. Learn more at www.charitywater.org. FCB (Foote, Cone & Belding) is a global, award-winning and fully integrated marketing communications company with a heritage of creativity and success dating from 1873. With its largest and founding office in Chicago, FCB focuses on creating “Never Finished” campaign ideas that have the power to transform brands, businesses, and communities. With more than 8,000 people in 109 operations in 80 countries, the company is part of the Interpublic Group of Companies (NYSE: IPG). Visit fcb.com or follow @FCBglobal on Instagram and Twitter and FCB Global on Facebook.